Last week it was announced that the Salaries and Allowances Tribunal was reviewing local government pay rates, with a decision due in the next few months. Currently, the local mayors earn $60,000 a year plus $14,000 in sitting fees. This is compared to other Australian mayors who receive up to $180,000. 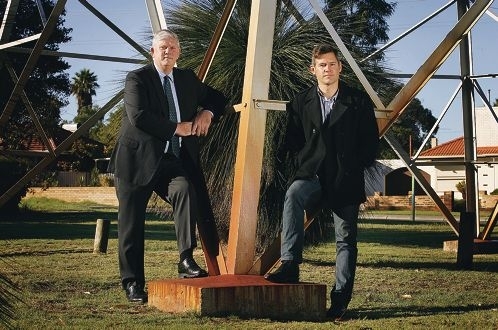 While the three mayors ” Melville’s Russell Aubrey, Cockburn’s Logan Howlett and Fremantle’s Brad Pettitt ” were not prepared to put a figure on what they should earn, they were pleased a review was underway. Mr Aubrey quit his full-time teacher job at Wesley College earlier last year to focus solely on his mayoral commitments. ‘I recognised there was a growing level of commitment needed to fulfil the duties that an elected member requires and an increasing level of professionalism,’ he said. Both Mr Howlett and Dr Pettitt also work as full-time mayors, with Dr Pettitt also calling of a review on councillor wages. ‘The money is obviously not what drives me or any of the other mayors or councillors I know to be involved in local government, but you also don’t want a level of pay so low that you discourage quality candidates from applying,’ Dr Pettitt said. Mr Howlett said dealing with budgets that exceed $100 million, a contribution at local, regional, state and national level and the overall hours councillors contributed each week were factors that needed to be taken into account with their salaries, particularly when compared to their counterparts in other states and territories. WA Local Government Association president Troy Pickard, who wants a pay rise for everyone in local government, said mayors and elected members were paid significantly different to those in other states. ‘We believe that to not compensate elected members appropriately restricts the pool of eligible candidates, potentially to the detriment of the local government and the community,’ he said.